First anniversary of the blog and my first giveaway - Low-Carb, So Simple! -- gluten-free, sugar-free recipes with 5 ingredients or less | Low-Carb, So Simple! + bonus: 2 secret recipes using that sea buckthorn juice! I’ve never done a giveaway before, but now I wanted to try out how it will work in practice. I have purchased all the products myself, except the Zsweet sweetener is sponsored by YesDeli, a great Finnish company which imports and sells high-quality special groceries. You have one week time to participate. The last day to leave a comment is 26th May 2013 after which I randomly choose one lucky winner and let him/her know right away. Please leave your correct e-mail address (won’t be published) so that if you are the lucky winner I can contact you asap. If I don’t reach you within three days (= 72 hours), I have to draw another winner, which I really would hate to do. If there are some restrictions which apply in your country, I might not be able to ship your prize. In that case I have to pick another winner. The winner of my first ever giveaway is Annette. Congratulations! Many thanks for all of you for your kind comments and thanks for participating! That’s real indulgence! Thanks for your comment and good luck! You were the last one to comment and now it’s time for the draw! So simple and so great 🙂 Again a real challenge to convert into low-carb… Good luck with the draw! I am a big pizza lover. I could eat a slice of cauliflower crusted vegetable pizza everyday! It’s so great that there are nowadays proper and healthy low-carb alternatives for pizza crust. Pizza is a great way to have your daily veggies as well! Good luck with the draw! I love eating cotton candy! Oh yes, who wouldn’t! That would be a real challenge to convert a cotton candy recipe into low-carb. Maybe with maltitol that would succeed… The drawing is soon… Good luck! Nice blog and cool giveaway! My favorite comfort food is chocolate chip cookies. I’m still trying to perfect this recipe as low-carb. Thanks, Sara! I’m also trying to perfect a recipe for low-carb chocolate chip cookies… they are simply so good! Good luck with the draw! Yet another chocoholic, we are many! Chocolate always does its job. I really would like to develop a perfect recipe for flourless chocolate cake… Something very chocolatey… Good luck with the draw! Now that’s healthy comfort food 🙂 And sure delicious! Good luck with my giveaway drawing! Not a food but a mocha hazelnut latte from my favorite coffee shop always makes my day! Hazelnut is great! I wish they would have healthier alternatives for sugar-free hazelnut syrups, those what I have seen contain sucralose or aspartame. Good luck with the drawing! My comfort food is definitely egg omelet. You can do it within few minutes and with vegetable along, it´s the best combination! Oh yes, omelet is so versatile! And a good way to use veggies and leftovers from the fridge. Good luck with my giveaway! I always have a little stash of chocolate for when I’m feeling down. Me too… chocolate sure is healing the mind and body. At least for a moment… Good luck with the competition! I am so glad I found your blog. I am enjoying it and your easy and delicious recipes immensely. My favourite comfort food is dark rye bread spread with butter. Thanks for your kind words! Great that you enjoy my blog and the recipes. For me, everything tastes good with real butter 🙂 And I think dark rye bread with butter is also the ultimate comfort food for most of us Finns… Good luck with my giveaway drawing! Rose, so true about chocolate 🙂 And that comfort food really sounds too good to be true! Good luck with the draw! Alicia, that really suits every occasion! Great job with the blog!!!! It looks truly lovely for being so young, and I’ve loved every recipe I’ve tried. Beverly, so great to hear that you like my recipes! I cannot resist the combination of dark chocolate and raspberries… Yum! 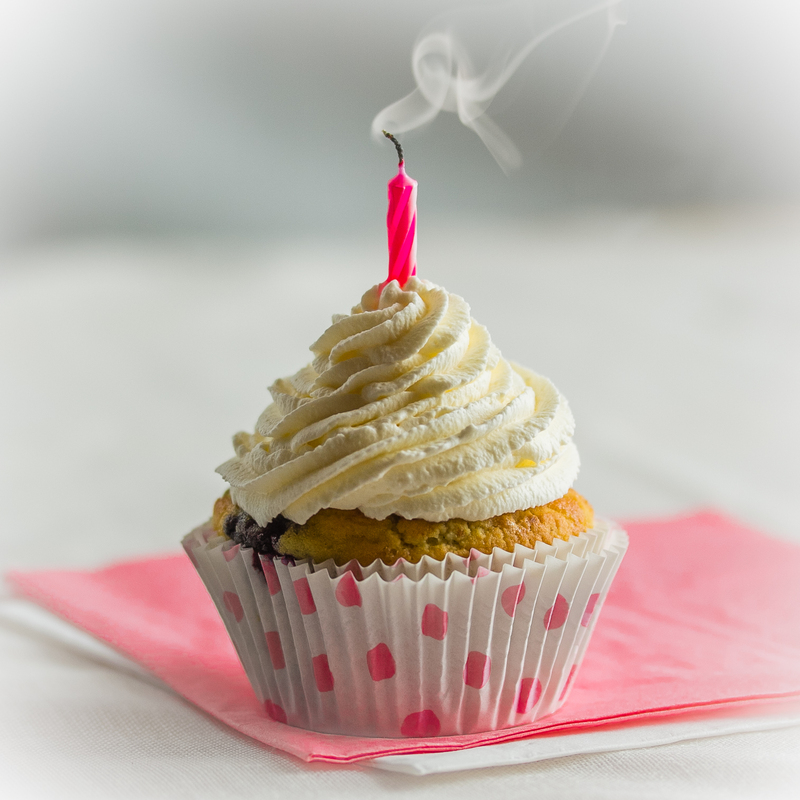 Congratulations Elviira on the 1st anniversary of your blog!! Well done on all the fantastic recipes. I baked your Simple and Fluffy Bread again at the weekend. I love its versatility for breakfast with butter and jam or for sandwiches. Sarah, many thanks for your kind words! I’m so happy that you like my recipes. A recipe for gluten-free and low-carb English-type scones sounds like a real challenge. But I love challenges 🙂 Thanks for a great idea and good luck with the draw! This might sound weird but I love Greek yogurt with cocoa powder mixed in. I eat it all the time! Madeline, thanks for you comment and good luck with the draw! Doesn’t sound weird to me, sounds delicious! First, congratulations on your anniversary! This is quite an accomplishment developing all these recipes using so few ingredients! I, for one, would be quite happy if, after a whole year of this restriction, you gave yourself permission to increase the number of ingredients per recipe. I love reading about your method in recipe develpment, and seeing your helpful and artistic photos. My favourite comfort food is/was ice cream. I could eat it every day (almost any flavour) if I weren’t following a low carb diet. I love ice cream, too! I just made an experiment using that brown sugar substitute which is included in the prize. Otherwise nice, but faaar too sweet. You can make low-carb ice cream quite easily. Have you ever tried? A LOT to be proud of in one year’s time too! Wonder what it tastes like? Am sure the question will not be unique to me! Thanks, Joanne! Sea buckthorn juice is filled with vitamin C and good oils. It’s very strong tasting and quite bitter. You can’t drink it just like that, but in drinks, sauces, frostings and toppings it tastes great! Good luck with my giveaway draw! Coconut milk ice cream or Dole whip can always cheer me up. In colder weather, I love a spicy chili with tortilla chips. Sounds yummy! Coconut milk ice cream is also my personal favorite. Good luck with the draw! My favorite comfort food is mac and cheese. That makes any day better! That’s real comfort food, indeed! Good luck with the competition! Eileen, depends on the recipe and the ingredients how the result tastes. Some sweeteners have really BAD aftertaste whereas some taste okay. I’ve tested numerous sweeteners and try to use those which I have found to be the best tasting. Goods baked with almond flour and whey protein usually taste pretty okay for everybody. Hope you find something useful and tasty, and good luck with the draw! No problem 🙂 Low-carb cheesecake has a dedicated place in my heart (and in my table) too. Yum! Good luck with the giveaway! My fav comfort food that I am able to eat every day is 2 minute protein cake. I use 1scoop of protein powder+1egg+pinch of baking powder+2tbsp of milk. Lucy, sounds like a great recipe! Thanks for sharing and good luck with the competition!